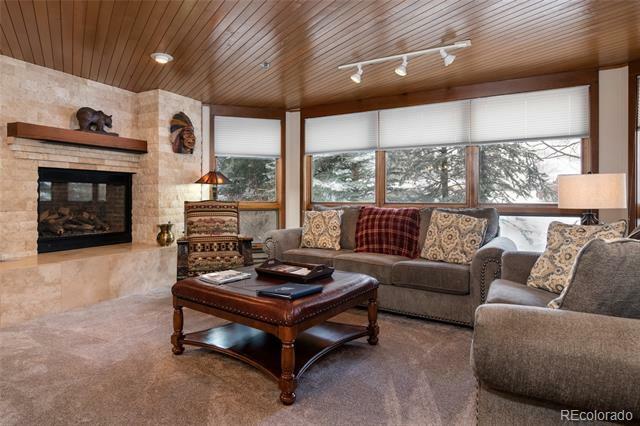 This Premium Rated slopeside property is located right on Steamboat's Mt Werner and is a ski-in, ski-out property. Shopping and some of the best restaurants are just steps away or via the complimentary shuttle. The single level condo offers floor-to-ceiling windows, tongue & groove ceiling, 2 bedrooms and 2 bathrooms sleeping up to 6 guests. The living room has new comfortable mountain furnishings around a gas fireplace, and a large flat-screen TV with gaming system. The newly renovated kitchen has stainless steel appliances, stylish new cabinets and granite countertops. The master bedroom offers a king size bed, flat screen TV, and a private bathroom with double sinks, and a new modern tile rain shower. The second bedroom hosts 2 twin beds that can convert into a king and flat screen TV. A skiersâ lounge boasts a locker room with a wall mounted forced air drying rack, outdoor gas fire-pit, BBQs, indoor/outdoor heated pool, outdoor hot tubs, sauna and even coffee/tea/cocoa service.